How much could you save by having LASIK today? Over 2,000 eye injuries occur each day on job sites across the U.S. and one in ten of those injuries required missed days of works to recover. Of the total amount of work-related eye injuries that occur, 10 to 20 percent will cause temporary or permanent vision loss. While many think that eye injuries only occur in construction, trade or manufacturing jobs, nearly 40% of work-related eye injuries happen in healthcare facilities, offices, laboratories and other similar work environments. Safety experts and eye care providers agree that the right eye protection could have lessened the severity of these injuries or even prevented 90% of them. Flying objects, particles, tools, chemicals and harmful radiation are the cause of most eye injuries. In many cases, implementing safe workplace practices and using appropriate protective eyewear could prevent injuries entirely. March is Workplace Eye Safety Awareness Month, which offers a great opportunity to remind everyone about a few tips to help protect eyes from potential injury. Eliminate hazards before starting work by using machine guards, work screens or other engineering controls. Always wear the appropriate safety eyewear, even if you are just passing through a potentially hazardous area. If you're working in an area with lots of particles or dust, be sure to wear safety goggles with side shields to protect against foreign objects from entering your eyes. 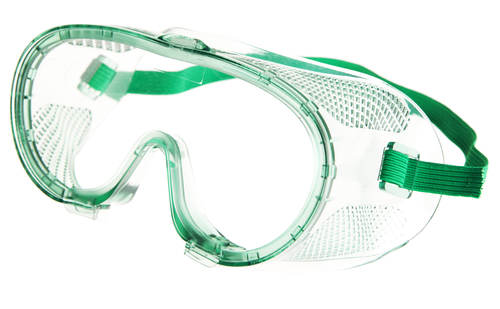 Always wear safety goggles or face shields when working with chemicals to protect against splashing. When working around hazardous radiation like welding, fiber optics and lasers, be sure to use specially designed safety goggles and helmets that are made especially for such tasks. Keep safety eye wear in good condition and replace when necessary. Remember that something as simple as putting on a pair of safety glasses can help prevent serious eye injuries. These injuries are not only painful, but they can cause many lost days of work and sometimes lead to permanent vision loss. Although March is designated as Workplace Eye Safety Awareness Month, it is important to remember to wear your safety glasses year round. What Does It Mean To Have A Color Vision Deficiency?